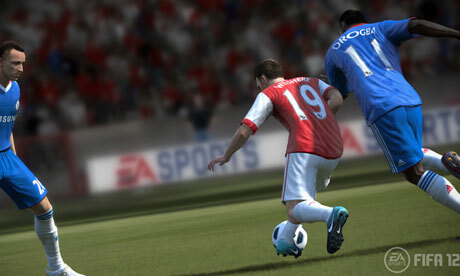 The word is out on FIFA 12: this may be one of the greatest sports games ever made. Fortunately, the game's trophies are just as much fun to earn as its matches are to play. Using this guide, you can earn 12 FIFA 12 achievements, or trophies, within one 12-minute game against the CPU. To make things easier on yourself, start in the Game Settings menu. Handicap CPU's settings to make computer players easier to dribble around. Also, adjust the settings to allow scoring on the computer's goal from 40 yards out. In the player's menu, set the injury frequency higher than normal. Next, enter an exhibition match against the CPU, setting the difficulty to Legendary and both teams to Brazil for the "Legendary" trophy. Turn off the offside rule and set all control settings to manual for the "All My Own Work" trophy. As the game starts, dribble straight ahead and pass to a teammate with an air-bound through ball or cross. Shoot when the ball is still in the air for the "Ruud Boy" trophy. If you're able to score within the first five minutes, you'll also earn the "Don't Blink" achievement. After the first goal, score four times on your own goal. Once you have fallen behind, give the ball to your opponent and slide tackle into their body. The goal is to earn a red card, so try to avoid the ball and dig your cleats into the opponent's legs as viciously as possible. If you have extra time, try for the "Megged" trophy by dribbling straight at opponents, then either passing to a teammate directly behind that opponent, or tapping the right analog stick forward in the opponent's direction. By the time the first half is over, you should be losing 4-1 and have a red card. Once the second half starts, try for a throw-in near the opponent's goal as soon as possible. This needs to be a "quick" throw-in, meaning one without a cutscene. Toss the ball back in and score within a few seconds for the "Quickly Now!" trophy. For your next goal, get the ball to Robinho. He's the best player for scoring a bicycle kick goal to win the "Riding Bikes" achievement. Juggle the ball near the goal, tap the left analog stick away from the goal to kick the ball up in the air, and then point the analog stick back at goal to attempt a bicycle kick. This is tricky to accomplish, so if you can't get it after a few tries, give up, because you need to hurry to score more goals. If you adjusted your players' injury frequency before the game, several should have minor injuries by now. Score a goal with any player who has a cross symbol on his fatigue bar for the "Warrior" trophy. Next, score any way you can to tie the game. To complete the comeback and earn the "No Draw For You!" achievement, score the winning goal in the 90th minute. If you complete the game as outlined and maintain solid defense, you'll also earn the "10 vs 11," "Comeback Kid" and "Precision Tackling" achievements. Now celebrate by changing your settings back to default and really enjoy the beautiful game!